The city apartment. For those of us that have or currently dwell in apartments above a city…this collection of images is for you and for those whose aim is to take to the heights with a less-is-more approach to possessions. For me, perhaps reminiscing about one’s early days in the city is a worthwhile recollection. Memories of growth and independence, for certain. Without a doubt, one’s first city apartment surely holds memories of being “young, optimistic and resilient”. Perhaps when one looks back it is with an awareness that happiness was and is certainly not equated with the size of one’s space. Rather, personal style knows no limit by square footage. Personal style can truly begin from the humble first apartments that sit high above and amidst the city surrounds. At least, this was true for me. City havens that find our personality, that inspire our creativity and our inventive spirit to call the four walls we dwell within our personal perfection. The city apartment. High in style within a city and world that surrounds that is constantly moving. Perhaps there is no other interior space that requires a “Less is more” approach (courtesy of architect Mies van der Rohe) to what surrounds than in the four walls of a city apartment. Of note, Mies van der Rohe adopted the motto “Less is more” to describe his “aesthetic of arranging necessary components of a building to create an impression of extreme simplicity. Every element and detail is to serve multiple visual and functional purposes”. Oh, so true when we look to our interiors. Large or small. Especially within the square footage of a city space. Perhaps it can also be said that filling such a space aligns itself as “the art of things chosen well rather than often”. Surrounding oneself with the things that have meaning and purpose and that are part of who we are today. Quality vs. quantity, indeed. Alas, less is more. Consider with appreciation the city apartment and the stylish spaces that do not require much square footage but simply personal style. Again, Style & taste cannot be defined by the size of a room. So to those that adore the city and the life within it, bravo to creating refined style in smaller spaces. Style cannot be limited by size. Onward in that…with style. “My space is small. My life is big”. The embellishment of crimson red and boughs of pine against the backdrop of Chicago was a stunning view to behold. For certain, I adore this city in all seasons. From behind the lens my eye will never tire to seek and capture a mere visual of the artistry of fashion and its windows that seek to beckon those that pass by. Onward to another year of capturing fashion and a city ahead. 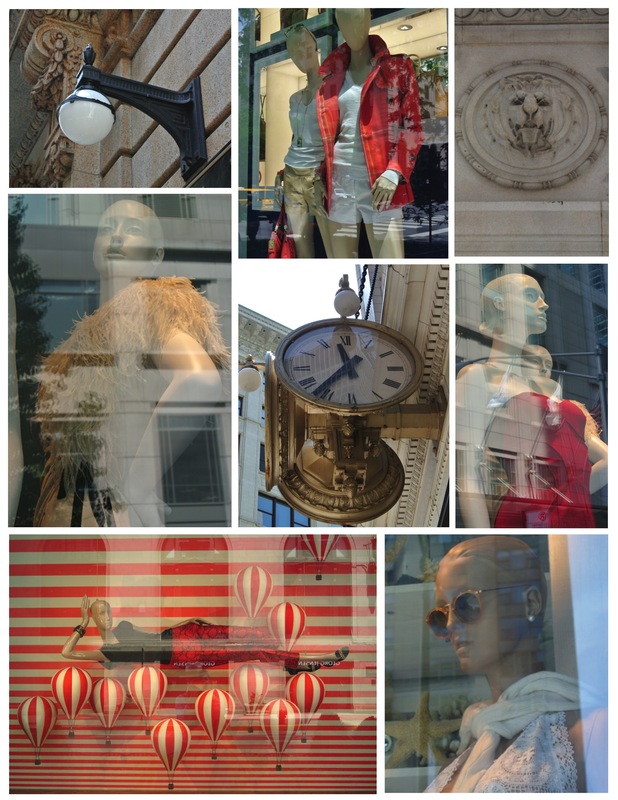 For one who has photographed the fashionable windows of Chicago every single month for over 3 years…onward! Myself Captured in Reflection: Fashion & The Photographer’s Selfie. Chicago in June. Yesterday found me venturing by train into the city of Chicago. As always, seeking inspiration and rejuvenation from the city by Lake Michigan. Surveying the changes a city takes on during the season of Summer’s arrival, onward I walked and walked. My camera and I. As the Summer’s heat infiltrated the city streets, the appreciation of the gusts of air conditioning from the storefront open doors seemed to lure the passerby’s inwards. Perhaps seeking a quick relief from the sudden heat or perhaps seeking inspiration with a wallet filled with planned weekend splurges. Summer shopping at its best. Color bursting from the store windows added visual “pops” of inspiration. As always, the architectural details are always a lure for my camera lens, no matter the season. The city in June is embellished with “green” life. Palms graced the city scape, visually evoking the essence of Summer. Ivy laden structures seemed to lure a closer look of appreciation, providing a lush cover upon distinctive architecture. Beckoning me, for certain. And of Summer’s arrival? 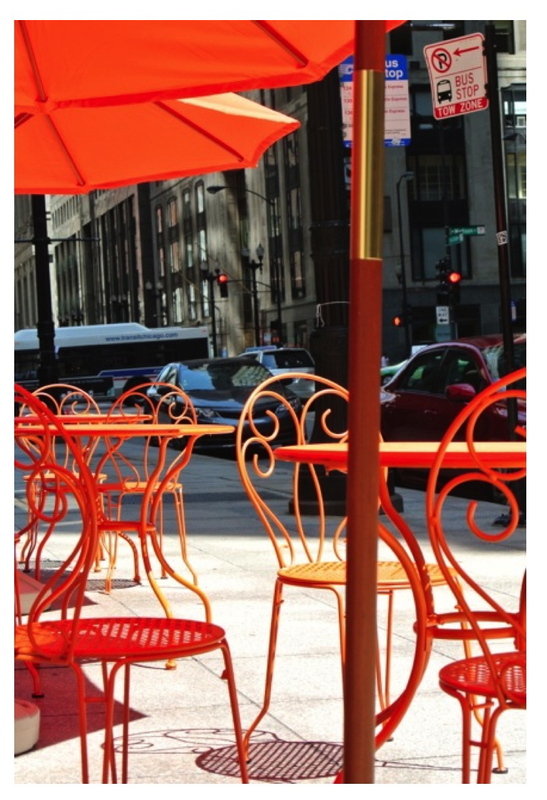 In a season where outdoor seating beckons the Chicagoans who have long awaited the sultry weather of Summer, the beach also calls for attention…. So, yet again, I ventured into the city that I adore seeking inspiration while gaining an opportunity for my thoughts to flow. And flow they did. Clarity. Living within the reach of Chicago is a gift. Validation of the benefit of living in the Midwest. Chicagoans embrace and relish their city with a strong passion during the transformation of their city within the Summer months. And of the tourists that have begun to infiltrate the city by the lake in droves? I, too, am one of them. With the exception that I claim the city as a past Chicagoan, as I have lived within the city and worked within the Magnificent Mile. Yet, with the tourists, I become one of them, melding into the backdrop of the crowds that walk the city streets. But my focus? With my camera in hand, continually seeking and capturing inspiration. Spontaneous expression. From behind the lens…. Cheers to the beginning of Summer in Chicago!